Saying “No” to discrimination is easy, but unfortunately practicing it is not. Zootopia (2016) shows how difficult this is, and why we should nonetheless do so, in a fictional world where a rabbit and a fox pursue a crime case together. Zootopia, the 55th animated feature produced by Walt Disney Animation Studios, is a fun, modern fable. It shows that Disney has gone a step forward in the messages of its cartoons by providing some important lessons about discrimination in this work. 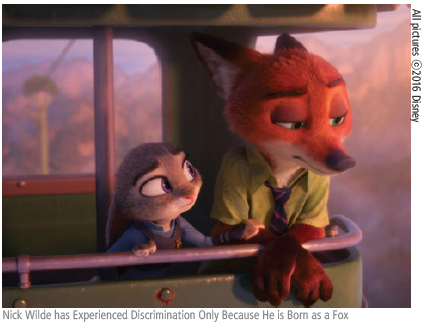 Nullifying the bias that animation is exclusively for kids, the general conception beneath the narrative of Zootopia, which consists of several contradicting relationships between characters, is not just for children. 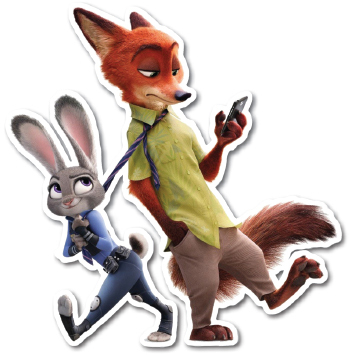 Directed by Byron Howard (Tangled) and Rich Moore (Wreck-it Ralph), Zootopia is a 3D computer-animated, buddy cop adventure-comedy, involving the unlikely partnership between a rabbit cop and a red fox con artist, voiced by Ginnifer Goodwin and Jason Bateman, respectively. The film also features celebrity voices from Idris Elba, Jenny Slate, and Shakira. Unusual for the animated films from this studio, Zootopia was released early in South Korea on February 17th, weeks before the North American release on March 4th. In a world in which anthropomorphic, intellectual mammals live altogether, little Judy Hopps dreams of becoming the first rabbit police officer. After great effort, Judy finally fulfills her childhood dream and is assigned to the city of Zootopia. However, in the police profession, where big, tough mammals usually serve as officers, not even the fact that Judy graduated at the top of her class is good enough. 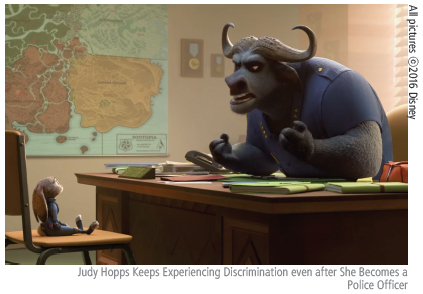 Chief Bogo, the head of the Zootopia Police Department and a big cape buffalo, excludes Judy from handling the most serious cases of missing predators and instead assigns her parking duty. The gap between her anticipation and reality depresses Judy. Even a red fox con man, who she meets on duty, ridicules her as a rabbit cop. At one point, Judy leaves her duty in order to furiously chase after a thief, who in the end turns out to have stolen nothing more than a few vegetables. Bogo gets upset with this mishap and, after a little fuss, gives Judy a chance to prove her potential in 48 hours by searching for the missing Mr. Otterton. Judy finds the red fox she met before, Nick Wilde. He is a tax evader, and Judy blackmails him into being her sidekick. In the search for the missing otter, Judy and Nick start to get involved in mysterious missing predator cases and in savage attacks done by predators, not knowing what truth awaits them. At first sight, Zootopia looks like a paradise where different kinds of mammals harmoniously live together; it is not. The city is actually full of discrimination, and many characters, including Bogo, Mayor Lionheart, and even Judy, prove this. The topic of discrimination penetrates the movie from beginning to end. Interestingly, the relationships shown in this movie are different from the old-fashioned ones, in which big, strong bullies distress the weak. From the beginning of the film, rabbits are considered unfit to be police and first appear as victims of unreasonable stereotyping. But they are not only victims. The rabbits are seemingly the most zealous in stereotyping others, as they regard foxes as sly and unreliable creatures. At this point, the small and physically weak mammals now become assailants as well. Prejudice made by manifold herbivores can even deprive a powerful predator of his position. Lionheart, a lion and the mayor of Zootopia, loses his position when most of the herbivores fear that he will lose control and attack them at any time. This composition differs from the traditional, exploitative relationship of big predators and small prey mammals, implying that anyone can be a victim of wrongdoing. To be more specific, anyone can be a victim at some time or other, as shown in the case of Lionheart. This will continue until the members of a society stop it. Therefore, Zootopia delivers the message that people should stop hurting each other, lest they also want to become a victim someday. However, this simple message is easily ignored, especially by those who once have been a victim. When the situation changes and the victims of discrimination take a superior position, they start to act just like the bullies who distressed them. In the movie, Judy shows exactly how this happens. While being interviewed, Judy, who is frequently hurt by those who have prejudice against rabbits, hurts Nick by implying that he is also a predator who can lose his intellect and ferociously attack his neighbors at any moment. Judy does not know that this will hurt Nick until she sees his face, but it hurts him all the same. It is difficult to avoid this behavior when one has already been a victim of it, thus grievances and even hatred against assailants grow. This is shown in a later twist in the movie when a character who has long been neglected, presumably by predators and consequentially grew antipathy toward them, comes into the picture. But that storyline should be experienced in the theater, not on the page in this article. Overall, Zootopia is not only a fun adventure-comedy but also a lucid objection to discrimination. Nevertheless, it also leaves something to be desired in its narrative, which is about Judy’s job. For a short period when Judy is on parking enforcement duty, many characters - Nick, Judy’s neighbors, and even Judy herself - regard the job as trivial. How would a parking attendant watching the movie feel about that? He or she would probably feel bitter about what the film is saying.